Cross section of the interface between a lead chalcogenide nanoparticle and its embedding cadmium chalcogenide matrix. 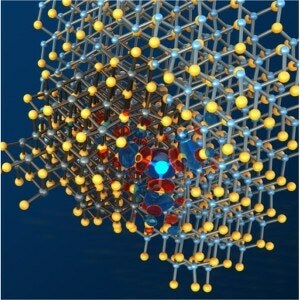 When integrated into optoelectronic devices, it is enough to have a single atom in the wrong place at the interface (represented by the glowing blue color) to jeopardize their performance. CREDIT: Peter Allen, Institute for Molecular Engineering, University of Chicago. However, it is highly difficult to comprehend materials that have distinctive functions (e.g. materials used in solar cells) and also to engineer techniques for enhancing the properties of such materials. As part of the prevalent attempts to enhance the efficiency of solar cell energy conversion, Scientists have started an in-depth analysis, at times even to the atomic level, to single out material defects that might impair the conversion process. For instance, heterogeneous nanostructured materials are extensively used in a range of optoelectronic devices such as solar cells. Yet, the heterogeneous nature of these materials makes way for their nanoscale interfaces to display structural defects that may have a negative impact on the performance of the devices. Since identifying the defects through experiments is highly difficult, a Research team from the Department of Energy’s Argonne National Laboratory and the University of Chicago resolved to run a sequence of atomistic calculations at Lawrence Berkeley National Laboratory’s National Energy Research Scientific Computing Center (NERSC) to discover the fundamental reason for defects in two regularly used semiconductor materials, namely, cadmium selenide (CdSe) and lead selenide (PbSe), and to offer design rules to prevent occurrence of the defects. In the case of this research, the focus of the Researchers was on heterostructured nanoparticles, here a colloidal quantum dot wherein nanoparticles of PbSe are embedded into CdSe. According to Márton Vörös ‒ co-author on the paper and Aneesur Rahman Fellow at Argonne ‒ such a quantum dot, or a core-shell nanoparticle, is similar to an egg, with a “yolk” formed of one material enclosed by a “shell” made of another material. Experiments have suggested that these heterostructured nanoparticles are very favorable for solar energy conversion and thin-film transistors. Yet, for making this a reality, Vörös and Giberti comprehended that in-depth knowledge of the nanoscale interfaces’ structure and regarding the presence of atomistic defects is inevitable. Hence Vörös and Giberti collaborated with Galli to develop a computational technique to analyze the impact of the interfaces’ structure on the optoelectronic characteristics of the materials, at the atomic level. They used classical molecular dynamics and first principles techniques that are not dependent on fixed parameters, and thus were able to develop computational models of the enclosed quantum dots. Giberti stated that the Researchers used this model as the foundation for a sequence of simulations carried out at NERSC to successfully characterize CdSe/PbSe quantum dots and discovered that atoms that are relocated at the interface and their corresponding electronic states, or the “trap states,” can have a negative impact on the performance of the solar cell. They were then able to use the model to predict a new material that does not have these trap states and should perform better in solar cells. Using our computational framework, we also found a way to tune the optical properties of the material by applying pressure. In future, the Researchers intend to apply the new computational framework to analyze other structures and materials. We believe that our atomistic models, when coupled with experiments, will bring a predictive tool for heterogeneous nanostructured materials that can be used for a variety of semiconducting systems. We are very excited about the possible impact of our work. The DOE Office of Science funded the research through the Midwest Integrated Center for Computational Materials (MICCoM) as part of the Computational Materials Sciences Program and the Center for Advanced Solar Photophysics Energy Frontier Research Center. NERSC is a DOE Office of Science User Facility.